AP ECET Stands for Andhra Pradesh Engineering Common Entrance Test. The ECET is one of the most popular Engineering Common Entrance Exam proposed by Ministry of Human Resource Development in February 2010. The AP ECET 2019 is the common entrance exam for all the diploma holders to get admission into the professional courses like Engineering, Pharmacy, and M.Sc. So, the candidates who have completed their diploma and qualified in the Andhra Pradesh Engineering Entrance Exam will get direct admission into the 2nd year B.E/B.Tech Courses. Therefore, the candidates who get admission into the Engineering Courses through the AP ECET Exam are called lateral entries. 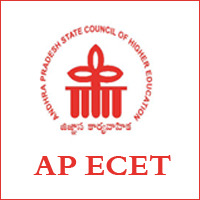 AP ECET 2019 Application Form Released. Candidates can Apply for APECET Exam from 18th Feb to 27th March 2019. Go Below to get Andhra Pradesh ECET Online Application Link. JNTUA will Conduct the APECET every year on behalf of the Andhra Pradesh State Council of Higher Education (APSCHE). The primary objective behind conducting this exam is to provide admission for the diploma holders into various professional Courses. 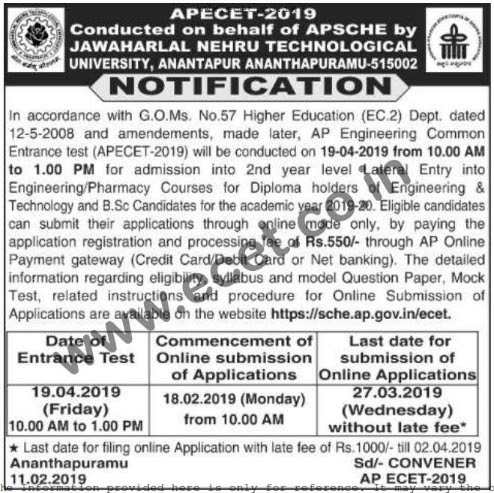 Jawaharlal Nehru Technological University Anantapur is the governing body for the AP ECET 2019. APSCHE will be Released a notification in February 2019 to organize the Andhra Pradesh Engineering Common Entrance Test. It is one of the most competitive exams in the Andhra Pradesh State. So every year a huge number of candidates are applying for the APECET 2019. In the year 2019-20, the officials are expecting the applicant’s count will increase than the last year. So, the candidates who are willing to pursue their higher studies like B.Tech, B.Phramacy can apply for the Andhra Pradesh Engineering Common Entrance Test 2019. The candidates can get the Complete details regarding the AP ECET Notification 2019, Eligibility, Syllabus, Previous Papers, Admit Card, etc. on this page. APSCHE is for determining the standards of various Higher Education Institutions like Scientific, Research & Technical. So, the candidates who are willing to apply for the APECET 2019 can get complete details on the following sections of this page. Notification Release Date February 2019. Application process starting Date 18th Feb 2019. Last Date to Apply (without late fee) 27th March 2019. Last date to submit Application with late fee Rs.1000/- 2nd April 2019. Date of Issuing the Admit card 20th April onwards. Exam Date 30th April 2019. AP ECET Results 29th April 2019. Rank card 6th May 2019. The candidates can get the eligibility details like the educational qualification, age limit and the nationality required to apply online for the AP Engineering Common Entrance Test 2019. The candidates must possess the following eligibility conditions then only you should apply. Otherwise, the officials will not consider your application. The candidates who are willing to apply for the exam must have passed any one of the following courses with an aggregate of 50% (General Category) and 40% (Reserved Category) candidates. The candidates should possess the following age to apply for the Andhra Pradesh ECET 2019. Maximum Age: 22 years for general and 25 years for reserved category candidates. The Contenders who qualified in the AP ECET 2019 will get admission into the following courses. The candidates can get the APECET 2019 Hall Ticket here. The admit card is the necessary document to be carried while appearing for the exam. The candidates have to produce the AP ECET 2019 Hall Ticket at the examination centre. The admit card will contain details like the examination centre and the date of the exam. So, the candidates must download the hall ticket before appearing for the exam. The candidates have to prepare well to qualify in this examination. So, to help you we have provided the AP ECET Exam Pattern. Look at the APECET Exam pattern So you can know which topics are necessary to prepare for the exam. Then go to the Syllabus section and prepare according to the weightage of the marks. Previous Papers plays a crucial role during the exam preparation. To help you we have provided the APECET Previous Papers. Sometimes the exam paper will contain the questions from the AP ECET Previous Papers. If the Candidates more previous papers then they can easily qualify for this exam. The aim of the applied candidates is to qualify in the exam. To do so, they have to prepare well. To make your AP ECET Preparation much better, we have provided some useful tips. So, the interested candidates can follow the following tips to crack this exam. First of all, make a detailed note of the syllabus. Then go to exam pattern section. You should give more importance to the topics having high weightage. Plan a schedule for your preparation. Finally, go according to your plan to succeed in the exam. The officials will announce the results after few days of the examination. We have provided here the direct link to download the Andhra Pradesh ECET Result here. So, the candidates who want to know the Andhra Pradesh ECET Results 2019 can stay tuned to our site. The candidates have to download the results to attend for the Counselling process. The candidates who have qualified in the exam must attend the Counselling. The last phase of the admission process is Counselling. The officials will verify the certificates. After the completion of document verification, the candidates have to attend for the APECET Web Counselling. So, the interested candidates can check the APECET 2019 Counselling Dates here. The candidates can get all the details from the direct links given below.